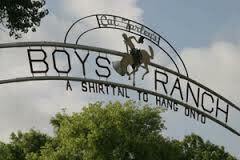 Boys Ranch was founded in 1939 by Cal Farley, a world-champion athlete and successful Amarillo businessman. That first year, nine boys were living on the original 120 acres- now there are about 300 boys and girls enrolled on the 11,000 acre ranch. It is a place where kids can find a shirttail to hang on to. Visitors enjoy watching the Labor Day Rodeo when boys and girls ages 4-18 years old compete. In June, attend the Boys Ranch Youth Cowboy Poetry Gathering, which teams some of the West's most talented cowboy poets/performers with students from Boys Ranch. Visitors are welcome daily, at no charge, 35 miles northwest of Amarillo on U.S. Hwy. 385. The Julian Bivins Museum at Boys Ranch is open 8-5 everyday, except major holidays. For more information call 806-372-2341. Group reservations are requested one week in advance.